Over the past year, the popularity of wireless Bluetooth speakers has risen from a collection of small, niche devices to a category of their own. When wireless speakers first appeared, they were expensive and the sound quality varied from so-so to terrible. Recently, the field has become crowded and with technology advances reducing costs, the landscape has changed for the better. 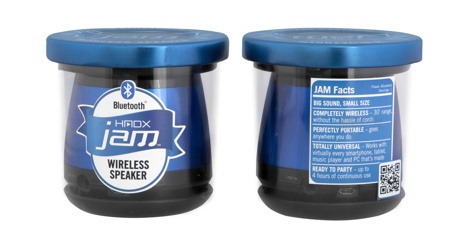 HMDX Jam Bluetooth Speakers are attention-grabbing due to their Oh, so cute jam-themed packaging. The speakers come in six flavors: apricot, strawberry, grape, blueberry, blackberry, and apple. 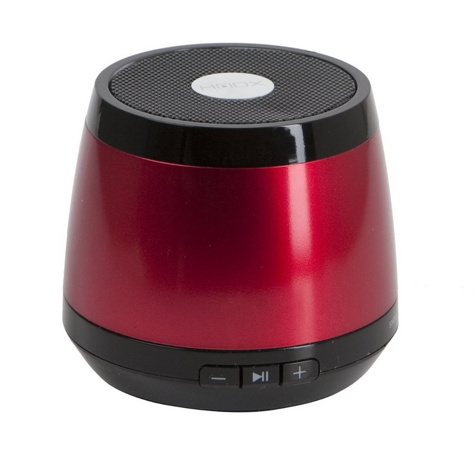 These portable speakers are a compact 3 inches in diameter by 2-5/8 inches tall. The jam jar lid cleverly unscrews to open the package. Under the lid is a short, ten inch USB to micro-USB cable for charging. Each charge yields up to four hours of playback. Don’t let the cuteness put you off. The stand-out feature of the Jam Bluetooth Speaker is the sound quality. Speakers of this size usually sound small, but the 50mm driver in this one is really punchy. There is a grippy rubber ring on the bottom of the speaker and it’s needed—the bass response would rattle the unit across a table without it. At high volume, small speakers usually produce a distorted roar. This one sounds good at all volume levels. Music of all genres is head-turning. Classical to rock, the sound quality for a unit this size is remarkable. Even voice is particularly distinct and clear. The unit is heavy and substantial. There are discreet LEDs indicating charging status (red & green) and Bluetooth connectivity (blue). The power switch is on the bottom of the unit is big enough for easy control. There are three smaller buttons on the side: Volume Up/Down, and Next track. Since these controls duplicate the ones on your iDevice, they seem a bit redundant. The packaging says, “The product is scented” but if is, it’s imperceptible. The product itself isn’t scented; a paper disc inside the container is. At $50.00, the HMDX Jam Bluetooth Speaker seems a little overpriced but at the street price of $35 – $40, it’s perfect for gift-giving—if you can resist keeping it for yourself.